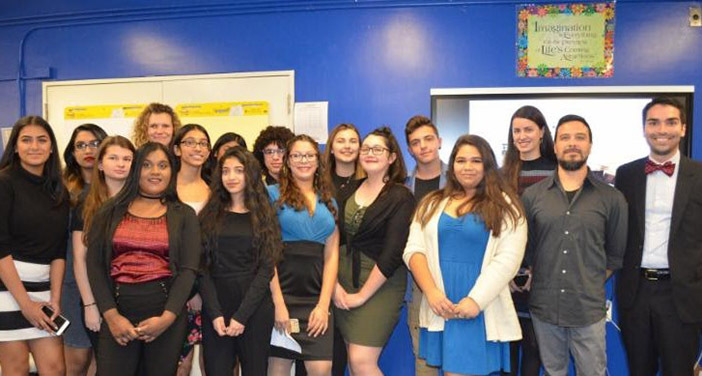 City Councilman Eric Ulrich (R-Ozone Park) recently joined Robert H. Goddard High School students for the unveiling of a mural the budding artists painted in honor of veterans and their families. The project, developed in partnership with the Creative Art Works program, was funded by Ulrich and aims to empower public school students through the visual and multimedia arts. The mural, entitled “For Our Tomorrow,” consists of five large canvases that honor the diversity, sacrifice, and courage of veterans and their families who “gave up their today for our tomorrow.” The original canvases will be on display at the St. Albans Community Living Center – a U.S. Department of Veterans Affairs facility on Linden Boulevard. A reproduction of the mural will also eventually be on permanent display underneath the Belt Parkway overpass on 84th Street in Howard Beach. The artwork was created by 15 students as part of an after school-program that included an apprenticeship component, according to Ulrich’s office. Apprentices were guided by professional teaching artists from the initial concept development through the presentation to the final brush stroke and public unveiling.